utman probably found the clue to this analysis in the writings of Theodor Adorno 2, who had seen in Parsifal a master-race agenda. As members of the "Bayreuth Circle" 3 had done in the 1880s and 1890s, Adorno saw the work in the context set by Wagner's regeneration essays, as published in the Bayreuther Blätter 4. Gutman might also have been influenced by the claim that Adolf Hitler took a very narrow view of the work in terms of blood, regeneration and selective compassion (see Rauschning's Conversations with Adolf Hitler or Gespräche mit Hitler, 1939, while keeping in mind that modern historians, such as Hitler's biographer Ian Kershaw, regard this book as unreliable). he first problem with Gutman's interpretation that has been pointed out in the wake of his book, and in the venomous debate surrounding the subsequent articles by Hartmut Zelinsky and books by his followers such as Marc Weiner, is the gestation of the work over decades: the story of Parsifal was worked out in detail already in the Prose Draft of 1865 and already there, the subject of the story is redemption and not regeneration. The first of the so-called "regeneration" articles (Religion and Art) appeared 13 years later. This fact did not inhibit Gutman or others in trying to interpret Parsifal as the embodiment of ideas explored in those articles. Although one might speculate that Wagner's ideas about regeneration and blood had begun to form before 1865, there is no evidence to support such a speculation. The content of those essays was influenced by Darwin, amongst others, whom Wagner had not read by 1865: therefore the suggestion that Wagner might have introduced a subtext about social Darwinism into his last opera is simply ludicrous. There have been attempts to detect some interests of Wagner's last decade, such as vegetarianism, between the lines of his (1877) libretto for Parsifal but even this is doubtful. detailed comparison of the opera's libretto with the 1865 Prose Draft shows no major differences: surprisingly little was changed. Although Wagner's preoccupations, concerns and interests changed between 1865 and 1882, it is evident that none of this led him to change the subject of his last opera: the original theme of redemption was not replaced by one about regeneration or anything else. It needs to be said (since many writers have assumed the opposite) that Wagner's world-view was volatile rather than static: he was always forming new opinions in response to what he recently had read or discussed with someone; although his respect for Schopenhauer never diminished. It should also be noted that Wagner frequently re-interpreted his earlier work in the light of new ideas and perspectives. In the 1870's such re-interpretation included even works such as Götterdämmerung and Parsifal that were unfinished. nlike the Bayreuth circle of the late 19th century, today we are less likely to see the work in terms of the regeneration essays; although it was often seen against this background during the 20th century. With better knowledge of how the work actually developed, from its genesis in the late 1850's to the completion of the poem (libretto) on 19 April 1877, it seems highly unlikely that the influences that Wagner absorbed, digested and finally presented in the essays of his last years, were significant in determining the ideal content of the work, which had been almost entirely defined by August 1865. For example, Wagner first met Count Gobineau in 1876 (Cosima's Diary, entry for 30 November) and only after meeting Gobineau again in 1880 did Wagner begin to study his writings5. Therefore it is not possible, as Gutman asserted, that Gobineau's racist ideas could have influenced Wagner before he wrote the detailed Prose Draft of 1865, or even the second one of 1877. Nor is it likely that Wagner had independently developed ideas similar to those of Count Gobineau, since there is evidence both in Cosima's Diaries and in her correspondence with Gobineau, that Wagner had violently disagreed with his racial theories. herefore it seems, to this writer at least, that much debate about Parsifal -- from Adorno (writing in the 1930's) through Gutman (writing in the 1960's) to some of the more hysterical commentators of recent decades -- has been mistakenly concerned with the ideas about regeneration that preoccupied Wagner while he was finishing an opera that had been worked out in some detail decades earlier. It might be argued that the theme of regeneration is incidental to Parsifal -- arguably less central than it is to Lohengrin, which also ends with a restoration -- although there is a consensus that Wagner's last opera is about redemption and compassion. Most of the criticism and commentary concerning Parsifal in recent decades has taken for granted that the work was inspired by the ideas of Darwin and Gobineau (both unknown to Wagner when he wrote his 1865 Prose Draft) and that (as also has been claimed for Die Meistersinger), the opera contains a hidden anti-Semitic subtext; so well hidden, in fact, that it never occurred to the Nazi's that such a subtext might be present. Rejection by the Nazi Regime? he second problem is the ban on Parsifal that Robert R. Gibson has proposed was enforced during war years in the 3rd Reich. If as Gutman asserts, this work was the gospel of National Socialism , why should it have been suppressed or discouraged by the Nazi's? Was it because the ideologues of the Nazi party did not share Hitler's enthusiasm for this work? Or was it perhaps that they found messages in the work that they disliked, and this dislike outweighed the regeneration message -- which might have been of interest to them -- that recently (1937) had been abhorred by their opponent Adorno? ncidentally, it was another work entirely that the Völkischer Beobachter had hailed as the gospel of the Nazi movement : the Foundations of the Nineteenth Century (1897-98) by Houston Stewart Chamberlain — at that time a central figure in the "Bayreuth Circle" during its second (Wilhelminist) stage, who married Eva Wagner in 1907, thus becoming the posthumous son-in-law of Richard. (H.S. Chamberlain never met Richard Wagner; the nearest he came was to see Wagner across a Bayreuth restaurant). o what are the messages carried by Wagner's opera that might have led to a ban on performances of Parsifal in the period 1939-1945, and its absence in these years from Hitler's Bayreuth? Which of these messages could have been the real problem and which secondary objections? It is even possible that the arguments with which the Nazi ideologues persuaded Hitler -- if in fact they were able to do so -- were not the real reasons for them wanting to forbid wartime performances of the work. In a paper delivered at the Wagner symposium in Adelaide last year 6, Robert R. Gibson suggested the following. irstly, although it portrays a warrior caste of Grail Knights, there is in Parsifal an underlying message of pacifism. At key moments in the work, the protagonist is disarmed. In the first act, Parsifal is upbraided for killing a swan, and as a sign of his growing awareness, breaks his bow and throws away his arrows. In the third act, he arrives as an armed knight, but allows his armour to be removed, to be replaced by the mantle of the Grail brotherhood, on which appears the emblem of the dove, a symbol of peace. Only then can he return to the shrine of Monsalvat. ven in the second act, which ends in a violent conflict between Parsifal and the domain of Klingsor, the only destructive act in that conflict on the part of the hero, is to grasp the spear and to make the sign of the cross. (In fact, his passivity throughout the opera does not commend him as an Aryan hero — in contrast to Siegfried). The spear itself, a holy relic, will not allow itself to be used as a weapon: when Klingsor throws it at Parsifal, the spear pauses above his head. Parsifal then shows himself more worthy than Amfortas to be guardian of the holy relic by not bearing it as a weapon ( denn nicht ihn selberdurft' ich führen im Streite ). This pacifist message alone would be sufficient reason, the Nazi ideologues could have argued, to suppress the work at least until the end of the war. The essence of all Nordic western art has been revealed in Richard Wagner. It shows that the Nordic soul is not contemplative, that it does not lose itself in an individualistic psychology. Rather, it experiences the willed, cosmic, spiritual laws, and shapes our art spiritually and architectonically. Richard Wagner is one of those artists in whom three factors coincide, each of which form a part of our entire artistic life: the Nordic ideal of beauty as it appears outwardly in Lohengrin and Siegfried, linked to deepest feeling for nature; the inner will of man in Tristan und Isolde; and the struggle for the highest value of Nordic western man: heroic honour, linked with inner truthfulness. This inner ideal of beauty is realised in Wotan, in King Mark and in Hans Sachs. Conversely, Parsifal is a strongly emphasized weakening of the will in favour of an adoptive value. hirdly, the women portrayed in the opera are no better role models for the women of the 3rd Reich, than Parsifal is exemplary of the Aryan male ideal. His mother Herzeleide is a war widow who attempts to shield her son from weapons and fighting, and dies of a broken heart when he leaves her in pursuit of a band of knights. Kundry is obviously a foreign element but (despite the subsequent analysis of Weiner in which she becomes an anti-Semitic stereotype), Wagner's sympathetic treatment of this degenerate, predatory female might not have appealed to the ideologues. ourthly, the ban occurred at a time when the National Socialist party was attempting to suppress homosexuality. The SS were forbidden to touch one another, but in the opera we see a community of male warriors who embrace during their ceremonies. rom 1934 to 1937 there was a series of cloister trials in which the monks of German monasteries were tried for alleged homosexual activities. In a broadcast speech in May 1937, Joseph Goebbels denounced the unnatural life of unmarried priests and monks, and he described monasteries as breeding places of vile homosexuality . Given the Nazi campaign against the Church and in particular the attempts to discredit monasteries and other religious communities, it is not surprising that an opera in which an all-male religious community triumphs over adversity through the recovery of a phallic symbol would be unwanted. inally, although Parsifal is less complex than the Ring, it is still a multilayered, multidimensional, opaque work that allows of many different interpretations. In that respect, it is the antithesis of totalitarian art. The latter is characterized by simple messages, unambiguous images and uncomplicated archetypes. Even if Parsifal can be interpreted as a homage to Aryan supremacy, this objective is obscured by other, more obvious messages that would have disturbed Nazi ideologues. We see a youth destroy his weapons, renounce sexual union with a woman and join an enclosed, all-male, religious community. In short, doing everything that a good Aryan youth of the 1930's was not supposed to do. esearch into the records of opera houses within the Third Reich carried out by Katherine R. Syer has shown that there were, in fact, both staged and concert performances of Parsifal during the war years. There is a recording (issued on CD by Preiser Records, 90261) of the third act of the opera in a concert performance given in Berlin on 31st March 1942. Parsifal was not performed in Munich during the war but it was in von Schirach's Vienna. In Hamburg, Parsifal was performed annually from the 1929/30 season until that of 1942/43, on average three times per season; in 1936, a new production directed by Oscar Fritz Schuh and designed by Emil Preetorius ran for seven performances. In Frankfurt, which fell within Goebbels' sphere [as head of the Reich Chamber of Culture], Parsifal had been performed annually in the period between the wars, invariably around Easter time. Parsifal suddenly disappeared from the Frankfurt program in 1940, only to resurface in 1941, 1942 and 1943. In Dresden, Parsifal was performed every season from 1914 to 1944 inclusive, with the number of annual performances fixed at four from 1933 to 1944. What Goebbels actually dictated for his diary on 22 November 1941 was this: "Contrary to what has been reported to me, the Führer does not want Parsifal to be performed solely in Bayreuth again; he only means that one should modernize the décor and costumes of Parsifal somewhat. Either we have to get away from this Christian mystical style, or Parsifal in the long run won't be able to retain its place in the modern repertory. The Führer gives me several suggestions, which I will immediately put into effect." herefore we must conclude that, even though some Nazi idealogues had reservations about Parsifal and despite Hitler's dislike of the "Christian mystical style" in which it had until then always been presented on stage, both Hitler and Goebbels were looking forward to new productions of the opera after the war. Nike Wagner's suggestion (The Wagners, page 139), that Hitler wanted Alfred Rosenberg to rewrite the text should not be taken as hard fact, although we can assume that Rosenberg would have done so if asked. She reports her father, Wieland, as saying, "Hitler virtually prohibited Parsifal". Like much else in Nike Wagner's book, this should be taken with a pinch of salt. 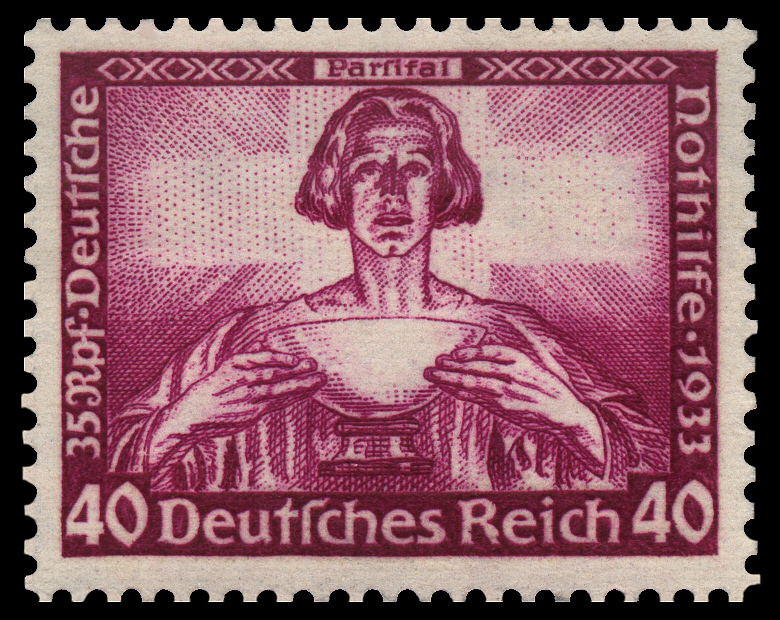 Virtually or otherwise, there is no evidence that Hitler prohibited Parsifal at any time. It is possible that certain of his subordinates, on the basis of some hint from Hitler, discouraged performances of Parsifal because its pacifistic message was considered unsuitable for the war years. But that would be speculation and in the absence of evidence for a ban, and in the presence of evidence of some performances during the war, we can only conclude that there was no ban on Parsifal. Footnote 1: Richard Wagner: The Man, His Mind and His Music; Robert Gutman, 1968. Footnote 2: Versuch über Wagner; Theodor Adorno, 1952; English translation by Rodney Livingstone, In Search of Wagner, 1981. Footnote 3: The definitive work on the "Bayreuth Circle" is Der Bayreuther Kreis von seiner Entstehung bis zum Ausgang der Wilhelminischen Ära. Wagnerkult und Kulturreform im Geiste völkischer Weltanschauung; Winfried Schüler, Aschendorff, Münster 1971. To the extent that the "Bayreuth Circle" had any influence, it was exerted through a publication that Richard Wagner had established in his last years, the Bayreuther Blätter. Wagner appointed Hans von Wolzogen as editor, in which post he remained until his death in 1938, at which the journal ceased to be published. The Bayreuther Blätter has been described as the publication forum for the "Bayreuth Circle"; although it might be more accurate to regard the list of authors, whose articles were selected by von Wolzogen for publication in the Blätter, as defining the membership of the otherwise insubstantial group known as the "Bayreuth Circle". Although the continuity of the editorship maintained a certain continuity also in the content of the journal, Schüler was able to distinguish three distinct stages or generations in the "Circle". Footnote 4: Schüler pointed out that Richard Wagner's ideas about redemption and regeneration culminated in Parsifal. It was therefore natural that, after the publication of Wagner's Religion and Art and a series of related articles in the Blätter, other authors should take up Wagner's ideas about redemption and regeneration in later issues of the journal. Their articles almost invariably related those ideas to Parsifal. The subsequent history of articles relating to Parsifal and the theme of mankind's potential regeneration has been documented by Mary A. Cicora in Parsifal Reception in the Bayreuther Blätter. In this study, based on Dr. Cicora's doctoral dissertation, the subtly different perspectives of the "Bayreuth Circle" (that is, the authors who published in the Blätter) are illustrated by selections from articles in each of the three stages of the "Circle". Footnote 5: This subject is discussed in depth by the editor of the Wagner- Gobineau correspondence, Eric Eugène, in Wagner et Gobineau: Existe-t-il un racisme wagnérien? ; Le Cherche midi, Paris, 1998. Footnote 6: Published in Wagner vol.20, number 2, pages 78-87. The paper was originally given at the "Wagner at the Millenium" symposium held at the University of Adelaide, South Australia, 25-27 November 1998.